Among the heavier lines of AA Co composite steers sold at Longreach today was this line of 154 backgrounder steers 322kg at 11-16 months, which made 294c/kg to a downs feedlot buyer. THE Australian Agricultural Co’s drought-driven sale of 5000 young steers from its desperately dry Barkly Tableland properties today produced a better-than-expected result, enjoying a market lift of 15-20c/kg over recent comparative rates, and up to 25c/kg in places. The lift in the market was clearly triggered by renewed buyer confidence, following patchy storm rain across parts of Queensland and NSW last weekend, and the prospect of more rain in coming days from Cyclone Trevor in the Gulf of Carpentaria. The 5200 AA Co steers offered at Longreach today were sold in 55 lots averaging about 100 head. They were backgrounder and light feeder weight Barkly composite steers, mostly number 8’s from 200-300kg and 300-370kg, drafted into tight weight ranges. While the heavier cattle had a bit of condition in them, lighter cattle were plainer in condition. No surprisingly, given the pasture conditions and feed costs across most of eastern Australia, the heavier steers sold better, making 290-300c/kg while the lighter lines sold upwards from around 275c/kg. Producers in Queensland’s northwest around Julia Creek, Richmond and Winton who received good to excellent rain on the edge of the flooded area following February’s big monsoonal low. Some onlookers said AA Co ‘dodged a bullet’ with today’s result, which could have been dramatically different, save for last week’s rain events and the prospect of more to come from Cyclone Trevor. People attending today’s sale in Longreach – which attracted a huge crowd, given it was the centre’s firsts sale in five years – said it was unusually humid by local standards, with Cyclone Trevor starting to make its presence felt. Elders agent Bob Jakins, who did the AuctionsPlus assessment on the AA Co cattle, attended this morning’s sale, and said the result went better than what many might have expected earlier. “I haven’t yet spoken to AA Co, but I would have thought they would be pleased with the result,” he said. Three main buyers underpinned the market, each taking large lines of cattle upwards of 1000 each, Mr Jakins said. While one was operating discretely via AuctionsPlus, Taroom grass finisher Dennis Conway was active, as was Dalby feedlot operators Morgan Pastoral Co (Kurrawong and Whaka feedlots). Mr Jakins suggested many steers were possibly 15-20c/kg better than recent sales. “Heavier steers probably went best, but the demand was pretty strong right through,” he said. The lack of paddock feed and the high cost of hay and other feed sources perhaps kept lighter steers back a little. Significantly, several of the main AuctionsPlus buyers came from the state’s northwest, where there has already been some good feed response since February rain. “That pattern was also seen on AuctionsPlus last Friday, when 350 cows offered by Clark & Tait, off Mt Enniskillen at Blackall also sold back into Winton at the northwest at $1110 a head – well above expectations,” Mr Jakins said. 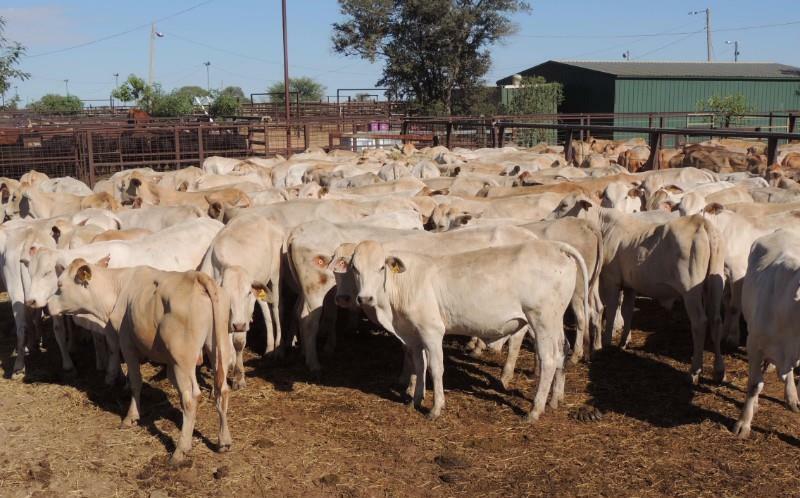 Today’s AA Co sale was the first of three large uplifts of young cattle from the desperately dry Barkly Tableland region taking place in Queensland. At next Wednesday’s weekly Dalby sale, Georgina Pastoral Co will offer 1600 predominantly Ultrablack heifers, all number 8’s, unjoined. The heifers are off Georgina’s Lake Nash Station on the south eastern side of the Barkly Tableland, which like much of the region has missed a traditional west season this year. Next Friday at Longreach saleyards, a second special store sale will be held, offering a further 4500 Barkly region cattle from AA Co and Australian Green Properties. AA Co’s catalogue at the sale will include 1000 composite and crossbred steers 200-350kg, and a similar number of their heifer sisters. The Australian Green Properties offering from the Tennant Creek region will include 2000 Droughtmaster and crossbred number 8 steers 250-350kg and 500 heifers 230-280kg. A great result – and Auctions Plus power to be so heavily involved in the physical Saleyard Markets shows the full power of a dedicated Sale by Description. Well done AACo and the Elders team – good work Bob Jakins. Buyer confidence in the Assessor was always the beginning of a great principle in Marketing power, and has been proven over time to give Producers and their Agents great support in Market strength.